Impact-A Crete Shield is formulated with surfactant and chemicals to prevent concrete and other foreign materials adhering to equipment. Crete Shield can be used to prevent cement, concrete, mortar, grout and stucco from sticking to treated surfaces. It is especially useful to protect concrete buil-up on ready-mix trucks, cement mixers, vehicles, forms, molds, cement buggies, pumps, trowels, screeds, concrete saws, augers or any other surface. Easy to use and helps keep your equipment looking new. It even removes the oxidation from paint and returns the paint to it's original luster. 100% biodegradable, non-toxic, non-flammable, non-corrosive, non-fuming and will not harm paint, metal, glass or other surfaces. 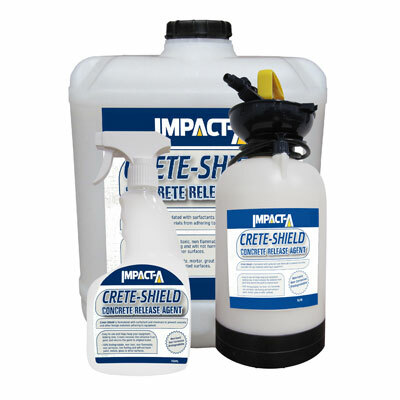 To buy IMPACT-A Crete Shield , please use the Store Locator below.